Verat Hosting Review 2019: Is Verat Hosting a Good Hosting? Serbian hosting provider Verat Hosting has been in business since way back in 1993. Its plans include premium software, but with fewer features than you might expect from such a leading hosting provider. Verat Hosting is one of the leading Serbian website hosting providers. Although not advertised on its website, the associated Facebook page tells me that this provider (or at least its parent company) has been in business since as long ago as 1993, which is a very long time in internet terms. The Verat Hosting website is provided in both in Bosnian and English. The three types of shared hosting plans (SSD, Linux, and Windows) all come with plenty of beginner-friendly features. 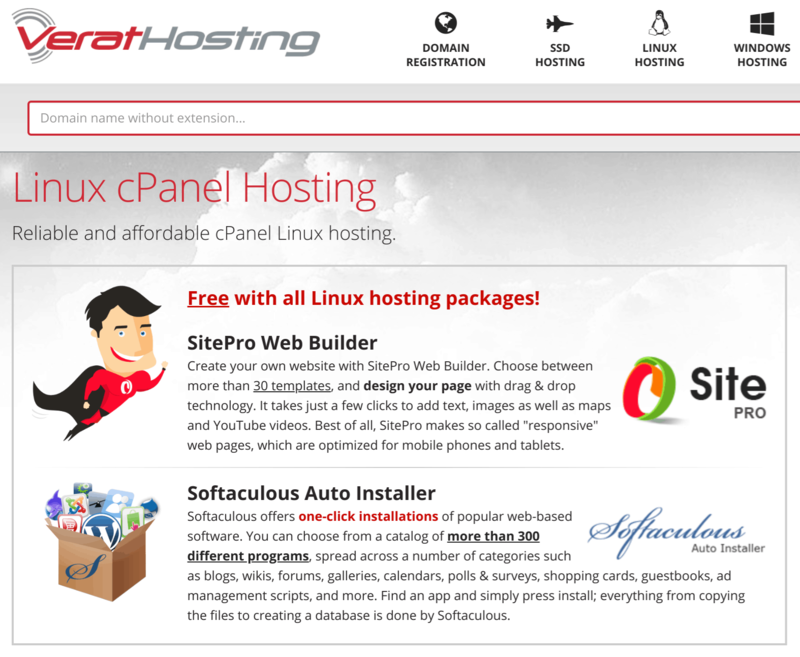 The SSD plan and Linux plan both come with SitePro Web Builder (a website building tool with 30 ready-made, mobile-responsive templates) and the Softaculous Auto Installer for more than 300 popular programs. For expert webmasters, the SSD and Linux plans support all the usual features such as PHP (versions 4.4 through 7.2), MySQL, phpMyAdmin, and FTP accounts. The Windows plans come with support for ASP, ASP.NET, and MS SQL. Whilst the feature list isn’t endless, it’s nice to see that it includes all the latest software versions. After chatting with support, I can confirm that a free Comodo SSL certificate is supported and automatically installed on all shared hosting plans. Also, remote MySQL connections are allowed from certain IP addresses, but SSH access is not allowed. Verat Hosting offers an industry-standard 99.9% uptime guarantee. This provider’s prices are in line with similar companies at home and abroad but bear in mind that all plans require you to purchase an SSL certificate and domain name separately. Plans can only be purchased on one-year terms, which is a little inflexible since there is no free trial and no money-back guarantee to get you out if it all goes wrong. What’s worse, when I tried to sign up, the checkout page kept crashing on me! The Verat Hosting website includes some FAQs, but not nearly enough to help you with your hosting issues. Verat Hosting has a simple website that sells a simple selection of Linux and Windows hosting plans. I had high hopes for this leading Serbian provider but was left a little underwhelmed by the fewer-than-expected value-added features. Everything you do get, however, is top notch. Wondering how Verat Hosting stacks up against other Web Hosting companies? Enter any other Web Hosting company and we will give you a side-by-side comparison.